Even with all the right fencing maintenance, some conditions can cause your residential fence to shift and lean over time. When you build a fence on your property, it’s essential that it is sturdy and secure for years to come. After all, you want your fence to stand up to years of weathering while providing security and looking stylish alongside your home. But even with all the right fencing maintenance, some conditions can cause your residential fence to shift and lean over time. But what causes this shifting and leaning? When it comes to choosing the right residential fence, stability and security are key. With the variety of materials to choose from for your fence, you can find a strong, durable fence that can be installed deeply enough in your lawn to remain stable for many years. Iron fences are great for stability over time, since the posts can be installed very deeply, and with the right anti-rust treatment, they require very little maintenance to remain strong year after year. The right fencing professional can install your fencing along the uneven ground and unconventional property lines while maintaining stability over the long term. Fencing maintenance is important for keeping up the aesthetic appeal of your fence, as well as its long term strength and durability. 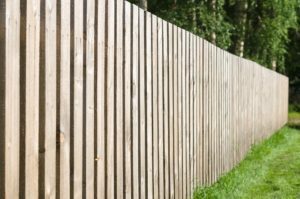 A lower-maintenance fencing material can be a great choice if you’re concerned about shifting and leaning down the road. Many homeowners choose vinyl for their residential fence due to its low-maintenance properties. Vinyl is easy to clean and does not require rustproofing. It will also not warp due to weather, wind, and water damage, making it extremely durable and less likely to shift or collapse. Even if you choose a highly durable, low-maintenance material for your residential fence, you may find that it shifts years down the road. This is often not due to the actual fence, but the shifting of the soil. If your lawn has structural instabilities or soil erosion, the shifting ground can cause your fence posts to lean. Luckily, your trusted fencing professional can help. Professionals can inspect your fence for the source of the leaning, implementing corrections and making repairs to make your fence stable again. They can also reinforce your fence in order to make sure it remains stable for years to come. Contact Hercules Fence of Virginia Beach at (757) 321-6700, drop in, or contact us on our website to learn more about spring and summer fence construction! You can keep up to date with offers and information from Hercules Fence of Virginia Beach on Facebook, Pinterest, LinkedIn, and Twitter. This entry was posted on Friday, March 29th, 2019 at 4:20 pm. Both comments and pings are currently closed.